Home / How Do We Create Terradynamics? As is the case with aero- and hydrodynamics, the creation of terradynamics requires integration of knowledge and tools of biology, engineering, and physics (Fig. 1). Figure 1. 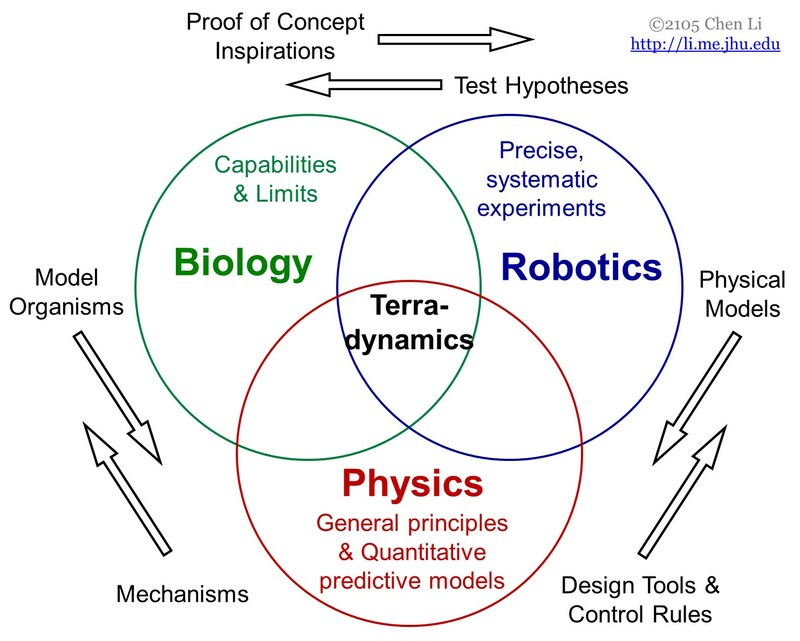 Creation of terradynamics requires integration of knowledge and tools of biology, robotics, and physics. Biology — We study animals behavior, kinematics, dynamics, physical structures, and sensors that enable and enhance movement through complex terrain. Robotics — We take inspiration from animals to design and build new robots of improved locomotor capabilities, and use robots as physical models of animals to test hypotheses. Physics — We perform systematic experiments and modeling / simulation to understand the contact physics between locomotors (animals and robots) and their surrounding terrain during locomotion. The integration of these three components allows discovery of general principles and creation of quantitative predictive models, which has proven powerful in understanding complex phenomena and predicting design and control of devices. Another unique approach we use is develop laboratory devices to mimic complex terrain, analogous to wind tunnels and flow channels. These devices enable control and variation of terrain parameters, and allow precise, repeatable, and systematic experiments. The mechanics and dynamics of fluids like air and water can be described by the same set of equations (Navier-Stokes). Although the diversity of natural, artificial, and extra-terrestrial terrain is much larger, we can still categorize them into broad categories and begin to understand movement in them through systematic experimentation and modeling. Figure 2. 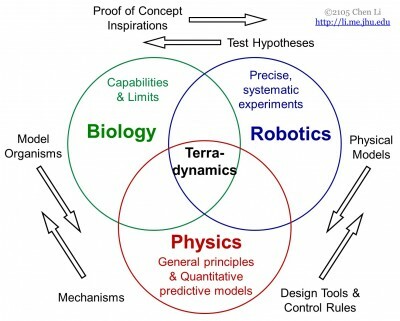 Creation of terradynamics requires integration of knowledge and tools of biology, robotics, and physics. 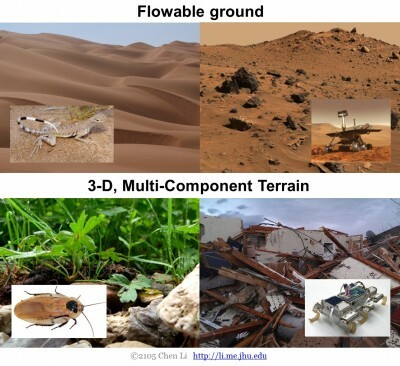 While future work will likely take advantage of these complex terrain systems (and insects and reptiles living in them), the lab is not terrain or organism specific. We apply the principle of using systems that are advantageous in discovering general principles, displaying extreme behavior and performance, and experimental feasibility. As we move towards a maturing field of terradynamics, we will turn to whatever system allows us to best understand animal locomotion and advance robotic mobility.